Have you heard? BiggerPockets Publishing is out with its latest release: The Book on Negotiating Real Estate—available now from the BiggerPockets Bookstore. Are you looking at properties and preparing to make offers? Then you need this book in your life! 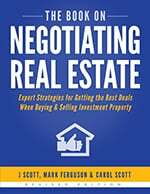 The Book on Negotiating is all about strategies for getting the best deals when buying and selling investment properties. It’s full of true-life stories, sample dialogue, and all the tips you need to close more investment deals with the highest possible profit. The Book on Negotiating was written by real estate power couple J and Carol Scott, along with veteran investor Mark Ferguson. Together, the Scotts have bought, built, rehabbed, sold, lent-on, and held over 300 deals, encompassing over $40 million in transactions. Mark has been an investor, as well as an agent/broker, since 2002. He has flipped over 165 homes and owns more than 20 single-family and commercial rental properties—one being a 68,000-square-foot strip mall! He’s also sold more than 1,000 homes as a real estate agent. It’s often debated among serious negotiators whether it is generally in your best interest to put out the first offer or to try to coerce the other party to make the opening bid. There are actually pros and cons for each side. And luckily, when it comes to real estate negotiations, there typically won’t be a struggle over who opens; in most of your real estate discussions, the determination of who throws out the opening bid will be made long before the negotiations begin. In other words, you likely won’t have a choice one way or the other. For example, when you list a house on the MLS—it’s unlikely that your real estate agent, your broker, or the people who run the MLS are going to allow you to list the house without including a price. Likewise, when you’re buying a house on the MLS—it’s pretty much certain that the seller will have chosen a list price; this is the opening bid and when listing a house for sale, the seller always makes it. On the other hand, there are going to be plenty of times when you contact a seller about buying her house and she says to you, “Hmmm… I’m not sure I’m interested in selling, but make me an offer…” It’s unrealistic to expect someone in that position to be making you an offer when she’s not even sure she’s interested in a deal. Given that you generally won’t have a choice about whether to make the first offer or not, we’re not going to continue the debate over which one is better or worse. Instead, we’re just going to discuss the benefits of each, so that when you find yourself in one situation (you having to offer first) or the other (the other party offering first), you’ll have an idea of how best to use this situation to your advantage. Let’s say you’re in a position where the other person puts out the first offer. Again, this could be a purchase off the MLS (or an FSBO), where the first offer is the list price of the property. Or, it could be an off-market deal where you’ve asked the seller how much she wants for the property, and she’s given you a number. The first benefit of having the other party put out the opening bid is that it allows you to define a mid-point for the negotiated price. Given the lack of negotiating skill exhibited by either side, it’s not surprising that the final agreed price ended up at $900—the exact mid-point of the first offer ($800) and the first counteroffer ($1,000). This is typical for inexperienced negotiators—once the extreme positions are set, each side continues to give in a little bit at a time, until they eventually end up somewhere between where each party started. They, in essence, find themselves “splitting the difference.” This is human nature—most people do not to want to give any more or any less than they’re getting, so people tend to increase or decrease their offers by the same amount as the other party. Now, when you can force the other party to state their position first, you have the ability to define the mid-point of the negotiation. Let’s see how that simple change in dynamic could have helped our homeowner in the example above. In this case, the contractor still makes the same initial offer to do the work for $1,000. But, our homeowner took the opportunity to define a lower mid-point with her counteroffer. She offered $600 (instead of $800), thereby reducing the mid-point of the two negotiating positions down to $800 (where she wanted to be in the first place). Assuming the contractor would agree on a price around the mid-point (as many inexperienced negotiators will), she was able to reduce the likely price from $900 to $800 simply by asking the other party to make the first offer. On the other hand, had the homeowner just opened the negotiation with an offer of $600, the contractor could have increased his ask to, say, $1,200, thereby increasing the midpoint back to $900. As you can see, the person who states the first position is at a disadvantage to the person who waits, as the person who waits can define the mid-point. The second benefit to getting the other party to open the negotiation is that it’s quite possible that the other party will surprise you by making a first offer that is better than the first offer you would make. Using our example above, the homeowner was happy to pay $800, and that was her goal in the negotiation. Knowing what she knows now, if she were forced to state her offer first, she’d likely start somewhere around $600, expecting the contractor to counter at $1,000, and settling at $800. But, what if the contractor was only planning to charge $500? By throwing out the first offer of $600, the homeowner has now told him that she’s willing to pay at least that amount and possibly more, so the contractor has little reason to quote her anything less than that. By stating her position first, she’s given away valuable information to the other party (in this case, her minimum price), and he will use that information to extract the most money possible from her. As you can see, having the other party put out the first offer provides two big opportunities for you to come out on top of the negotiations. If the other party puts out the first offer, take extra caution to avoid your first counteroffer being too low. Too often a first offer from the other party will anchor us (see below) much lower than our target and we’ll give in too much on this first counteroffer. Don’t do it! How would you grade your negotiation skills? Any questions about this new read?